Summer is smoke season over the Pacific Northwest, and forecasters, air quality managers, and others have a powerful new tool for predicting the smoke distribution: NOAA/NWS's HRRR Smoke. As I have discussed before, HRRR stands for High Resolution Rapid Refresh, a NOAA/NWS numerical weather prediction system that produces high-resolution (3-km grid spacing) analyses and forecasts every hour. 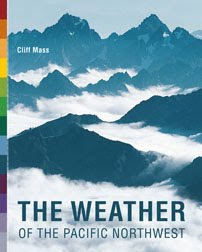 This modeling system was a major advance for short-term prediction, also known as nowcasting. 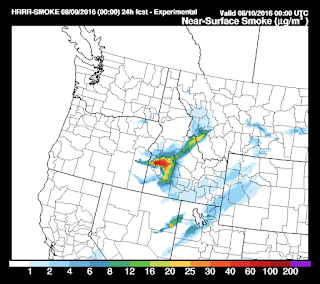 More recently, HRRR-Smoke was developed, a modeling system that predicts the distribution of smoke over the U.S.. HRRR-Smoke makes use of the atmospheric chemistry capabilities of the WRF-Chem modeling system, and determines the distribution of fires (and their intensity) based on satellite observations. 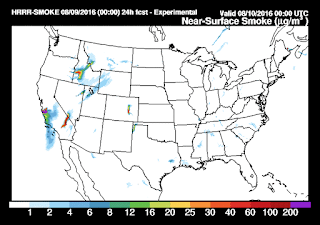 It then runs fire models that simulate the production of smoke that the wind field of HRRR smoke moves around. 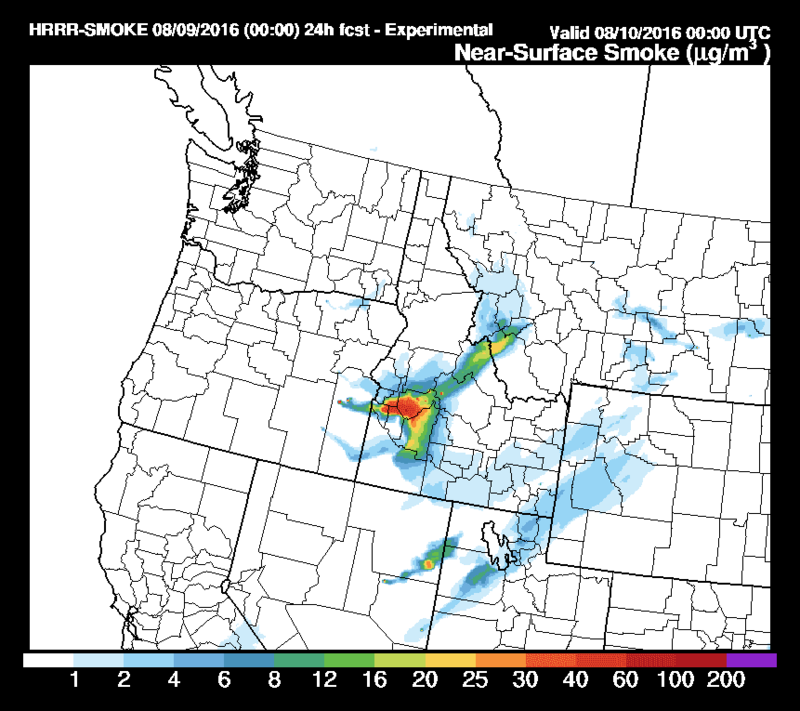 Here is an example of HRRR-Smoke for the 24h forecast for 5 PM today. Let's start with the national prediction--not much smoke over the Northwest, except for fires in eastern Oregon and Idaho. Yesterday's MODIS satellite imagery confirms that there is only limited smoke east of the Cascade crest. Lots of low clouds over the west. Future fires? The latest model runs suggest a warming/drying trend over the region, with ridging (high pressure) over the eastern Pacific, as illustrated by the upper level (500 hPa) map for 11 PM Thursday. Fortunately, there is little lightning expected this week, but some ongoing fires could surge as temperatures warm. Compared to many fields, I've consistently found that meteorologists and friends do a fairly good job with color/palette selection. One of these graphs just reminded me of how most graphs truly need to be "reverse video". I'll explain: I was reading the next blog post, "California Water Temperatures in the Northwest" where the usual colors give blue for "cool" and red for "warm", an admittedly usual interpretation. 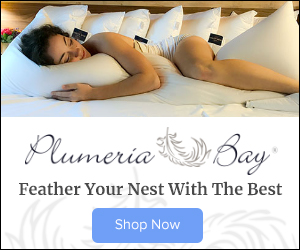 I typically read with black backgrounds, however, because white-text-on-black is a positive image; if I try to read a computer like a piece of paper, the big field of white washes out everything in a matter of minutes and I cannot see the negative image of the text. As I moved on to this article, still with the white background, I was reading the intro paragraphs, glanced down at the first map, and saw... nothing but the state outlines. "Hmmm, I guess there was no smoke this week". Reaching the end of the second paragraph I realized I was losing my ability to read, went back to white-on-black and... voila! there was smoke on the graph. "False color" / "reverse color" / "high contrast", whatever someone wants to label it to deem it "atypical" or "not normal for humans" is all immaterial. A simple contrast checker (second hit on favorite Internet search tool) gives a contrast of light-blue-on-white as only 3.4:1, versus light-blue-on-black as 6.2:1, versus (reverse of light blue)-on-black near 9:1, versus light-yellow-on-black as ~20:1 ! Let's see more black backgrounds on our graphs. Some people will see those little wisps for the first time. Imagine the possibilities!